It is amazing to me how fads come and go. In my brief time on this earth (eye roll inserted here), eggs have gone from being an everyday breakfast staple, to a big-time no-no at any meal, to a powerhouse of nutrition. When I was a kid, a big bowl of scrambled eggs was passed around the breakfast table. Yes, we almost always ate three meals a day together, sitting at a table, with no television or telephone. Notice I said “telephone” not “phones”. And the telephone was attached to the wall by a cord. If it rang, no one even looked at it because if you did, you had to get up and answer it. By the time you returned to the table, the egg bowl would likely be empty (I grew up with brothers). When I was in college, my dad underwent bypass surgery at the age of 55. He needed to lower his cholesterol and eggs had developed a nasty reputation. We virtually eliminated eggs, salt and, to his greatest disappointment, ice cream. He always said that the only good thing to come from his new “diet” was that he could no longer eat liver. He even told the doctor he would need a note for his wife that said he had doctor’s orders not to eat it! The doctor and the nurses laughed on that one for a long time. Today, the TV is often on. Our cell phones are never out of arms reach. Breakfast is typically an individual affair. Most evenings though, we share dinner at the table. Last night, eggs made an appearance in the form of frittatas. A frittata, aside from being really fun to say, is basically a crustless quiche. Technically, the cooking process for a frittata starts on the stove top and finishes in the oven or under a broiler. I take a much more simple approach and just bake it. I will occasionally finish it off with a minute or two under the broiler just to give it that perfect texture on top. 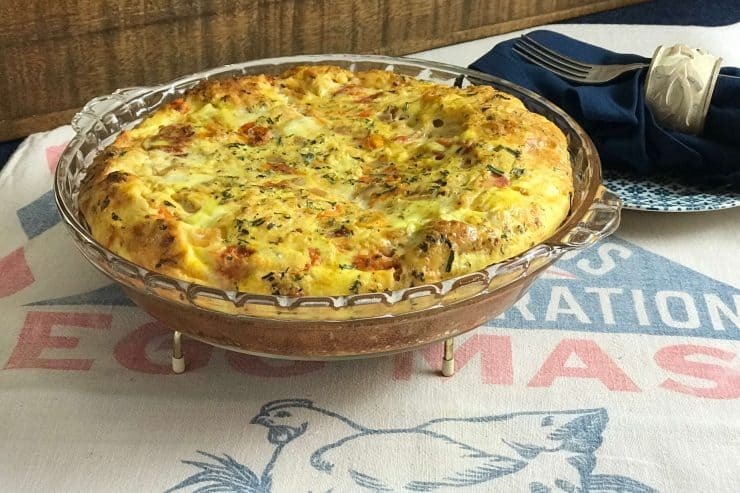 This protein-packed, super-simple, BLD (Breakfast-Lunch-Dinner) frittata recipe is a winner because it can be customized for your personal preferences or mood. 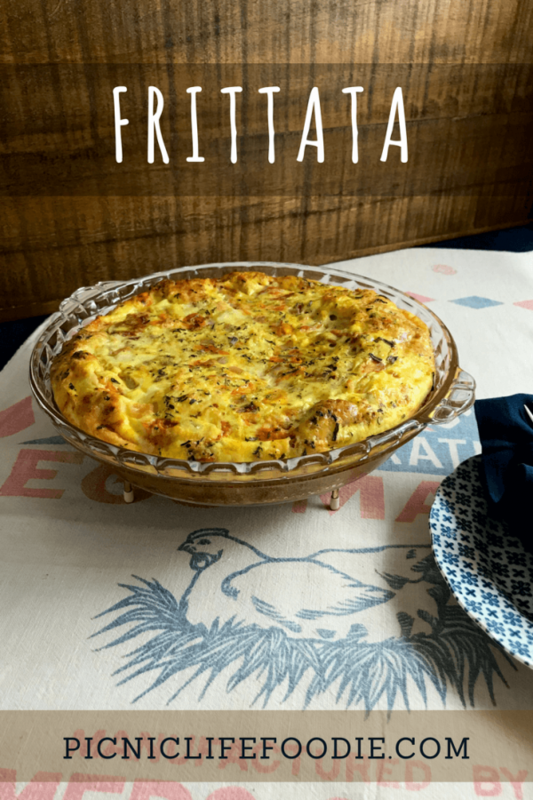 The meats, cheeses, and vegetables of your favorite omelette or pizza can make your personalized frittata! Bonus feature: leftovers (if there are any) reheat beautifully. Lightly coat a 9" glass pie plate with olive oil or cooking spray. Crack eggs, one at time (it is much easier to fish a random egg shell from one egg than it is from eight), into a bowl and whisk gently but thoroughly. Add milk, salt, pepper and mustard and whisk until well combined. 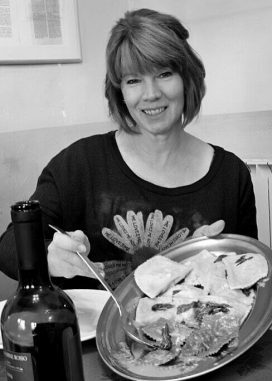 Place cheese, meat, vegetables, herbs and/or spices into pie plate (if still hot from sautéing, allow to cool a few minutes). Pour egg mixture evenly over the top. Bake for 15-18 minutes or until center of frittata is set (does not move when pie plate is nudged). Remove from oven. Place under broiler for a minute or two, if desired, to brown the top a little more. Remove and allow to rest for 2-3 minutes before slicing. This recipe is so versatile, you can create your own masterpiece. Ham, prosciutto, bacon, chorizo, sausage, chicken ... swiss, cheddar, monterey-jack, ricotta, chèvre, parmesan ... onions, peppers, corn, potatoes, mushrooms, asparagus, kale ... basil, oregano, thyme, chives, cumin, cilantro ... whatever makes your favorite omelette or pizza can make your favorite frittata. Another flavor-changer for this recipe is whether to use raw ingredients or sautéed. I think sautéing the meats and vegetables with the dry spices brings out more flavor. Some people prefer the texture of the raw ingredients (definitely cook something like potatoes that you wouldn't normally eat raw). 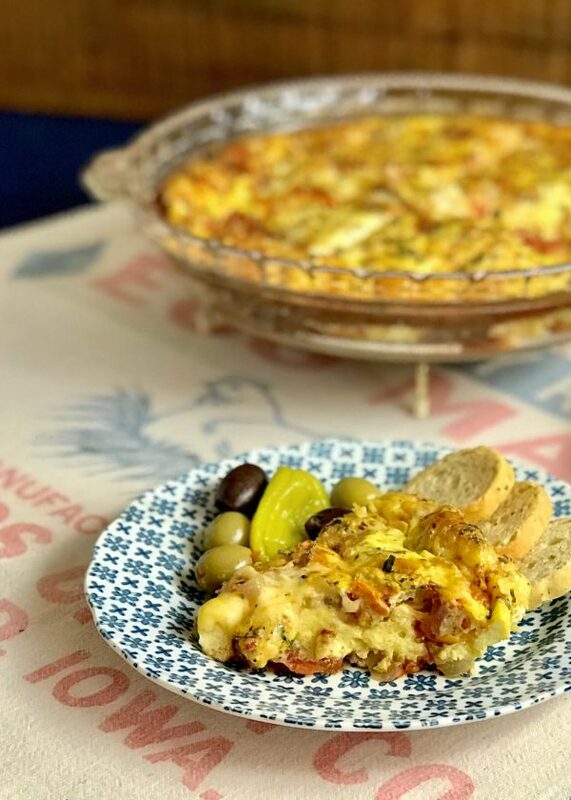 As mentioned in the recipe, if you are going to sauté the ingredients, let them cool a bit before adding the eggs or the eggs will capture the heat and start to "scramble" before they get into the oven. 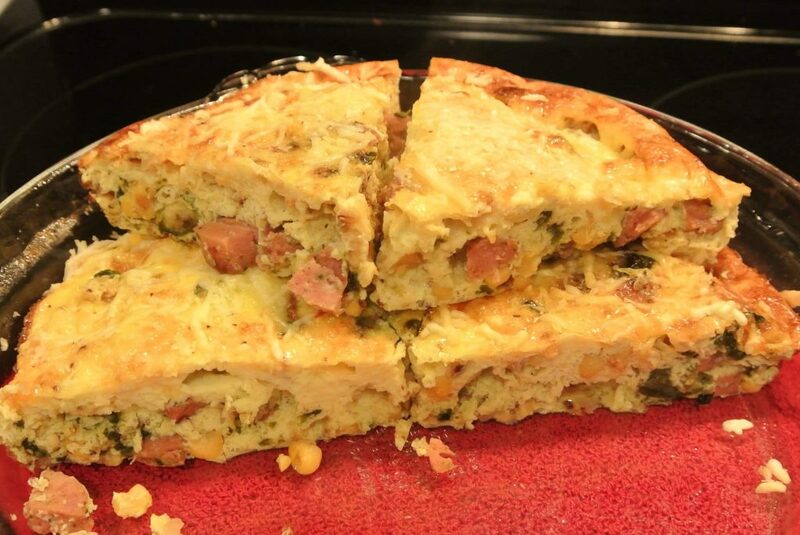 Although this looks like a ham and corn combination, it is actually a Mexican frittata. 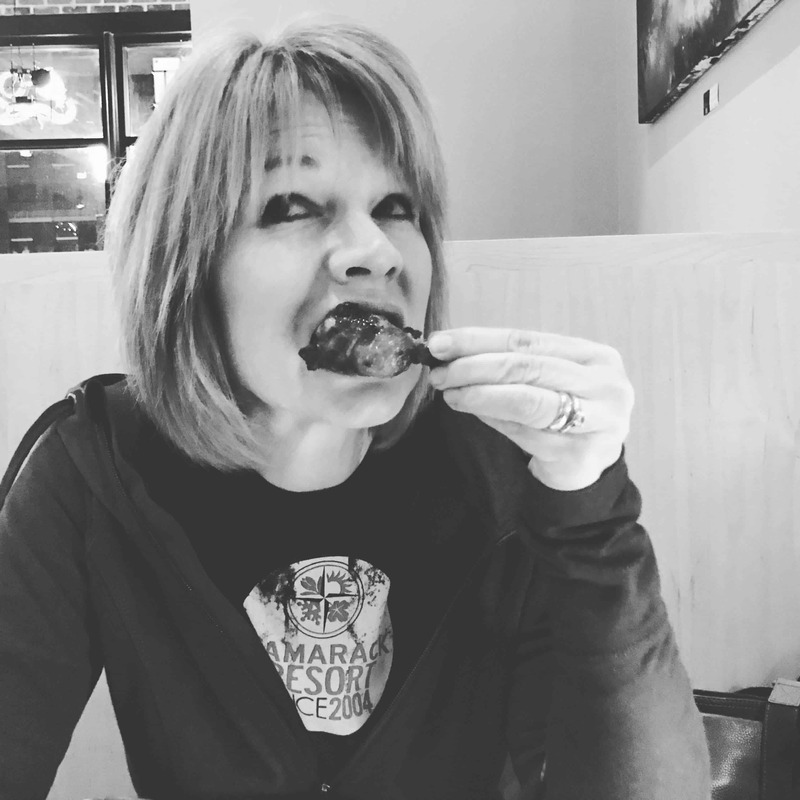 The meat is smoked chicken sausage with mango and jalapenos. It also has corn, onions, poblano peppers, stone-ground mustard and shredded Mexican cheese blend. Served with a little sour cream or enchilada sauce, it was a big hit. 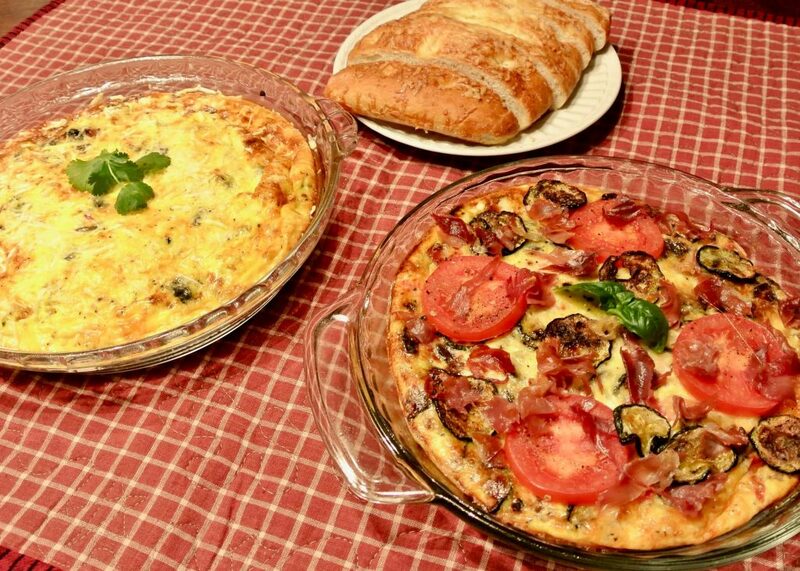 The frittata just described is pictured here on the left. On the right, is an Italian-inspired option: roasted zucchini, tomatoes, red onion, dried basil and thyme, prosciutto, Dijon mustard and parmesan. Although it looks much more impressive (at least to me), it wasn’t nearly as flavorful. Next time I think I would use sun-dried instead of fresh tomatoes, Italian sausage instead of (or along with) the prosciutto and ricotta cheese along with the parmesan. Yep … I can drive my family crazy with this type of analysis. Until they stop sitting at my table, and enjoying the leftovers for breakfast or lunch, I think I’m okay.